During my time seeing The Great Vision, I was told “You will go Coast to Coast, Border to Border”. This has been proven true…in more ways then one. I HAVE gone from the Mexican border (a town extremely close to it) AND to the Canadian border. I HAVE put my hands in the Pacific Ocean AND in the Atlantic Ocean. I have traveled Canada in a zig-zag drive to short miles from the Yukon, back to our border…back and forth to mere miles (24, I think) to Nova Scotia. A full 3 months doing this. BUT, that “in more ways then One” statement: The Coast To Coast night program. 2 years before THAT came about I KNEW I would be on that program. I had no idea how. Nor a way to “Check, Check, Check” All I could do was WAIT (and see). Then Glenn Kimball couldn’t make a program and told Art Bell of me. I received a call from his program coordinator Lisa Lyon…and “BAM”, I was on…and ON MY WAY to “Going Public”. Ordered to tell WHAT I was (Medicine man / Wakiyan)…I did so. Raising the hackles of most of our Native American people. (This is against Native American “Rules”). Our Society (Inner Heyoka) are not “controlled” by Tradition. Not Tradition “Rules and Regulations”. We have no series of leaders. We ARE DIFFERENT. OUR Leader is but one…THE LIVING CREATOR! Thus rules and regulations were broken. MAN Made “rules” were swept aside by obeying OUR Leader. Add to that, my Color. WHITE! Suddenly here I was (and AM)…”ANOTHER ‘PLASTIC’ “shaman” “! A “New Ager”. One “Demon Possessed”…and on and on. To add to THAT…seen by the “Christian World” as Demon possessed…SATAN…Liar…and on and on. I’ve been labeled it “all”. STILL, I OBEY OUR Inners’ LEADER. I will continue to, TOO! I guess I’m like a thorn in the side, to Many. It’s been, at times, Very difficult….BUT….I’M STILL HERE! Carrying out my Orders. During the time of The Great Vision, I was also told: “You will have 3 “enemies” : PASTORS , LAWYERS and DOCTORS”. This too, is becoming ‘fulfilled’. Not “bad” Yet…but I’m sure it will escalate as I go on. I was also told “I WILL GIVE YOU A NATION”. He Has…the CREES OF CANADA. “My” People! I MEANT it….and STILL LIVE BY IT! I’m Not a “preacher” (despise their misleading teachings)…though I APPEAR to be. No, I’m just what I’ve always been, a Medicine Man and Wakiyan….of the INNER HEYOKA SOCIETY. “Like it” or “Not”….I’M STILL OUT HERE! “Grandfather” …. the “THORN”! I HAVE NO ENEMIES….I Hate NO One! Aho? Why am I telling all this? TO MAKE YOU AWARE THAT “THE GREAT VISION” IS ! BEING FULFILLED! Red Elk is an Inter-Tribal Medicine Man. He is a self-described half-breed Native American / white, of both the BlackFeet and Shoshoni Nations, as well as part Irish and French. He is a member of the Heyoka (hi – OH – kah) Society, a Contrarian group of Native Americans who do not follow the normal path of mankind. Red Elk is one of twelve Inner Heyoka members. He is one of the nine members of the Red Web Society who are working to bring understanding of many hidden sacred teachings to the people of Earth. He is also an honorary member of the Cherokee Nations Twisted Hair Society. In 1973 Red Elk went on a 69 day fast, taking water, juices, and vitamins. On or about the 49th day Red Elk began to experience a vision about the future. For a little more than an hour each day for 3 days Red Elk saw and experienced a future that he didn’t want to see. The East and West coasts of America subside, a huge meteor strikes the Atlantic, unimaginably great earthquakes rip apart the earth as massive volcanic eruptions darken the skies and blacken the land. But these tribulations pale in comparison to what soon follows as the earth’s axis flips and ensuing floods and 300 mile per hour winds savagely destroy buildings, people, ecosystems and entire nations. Red Elk believes that there is Hope and that we have time to change and prepare… But the first thing we must change is ourselves. 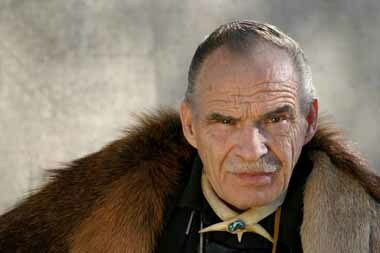 Posted on 10 June '10 by Living Documents, under Medicine Man, Red Elk Speaks, Tellings, Video. No Comments.